This was a sweet cowboy romance. I kept waiting for some silly drama, and it did not arrive. Instead they faced their problems and talked. Well, there was some drama, but hey, who doesn't get mad now and again. Cora is a single mom with a 12 year old son. She is trying to make it as a wedding planner. She is kind, fun, but with issues from her abusive past. Shane has his own demons. He took on the responsible for his family at 12. He felt he needed to do more. He was wonderful. So sweet, good and great. A cowboy dream. The drama then. His mom is getting married to a younger guy and the kids feel he is not after love, only money. And Cora has to deal with it all as she is planning the wedding. They get to know each other, they fall in love. The kid finds something to love too. It's a nice family, I'd love to see them all find love too. Sweet. Cowboys and romance, what more do you need. He did a good job, I have not read many, ok none contemporary romance with a guy narrating solely and I liked it. He had a nice range and I felt he did justice to all. As the oldest of three brothers, Shane Tyler takes his responsibility to the family ranch seriously-and it's clear to him that the younger man who wants to marry his widowed mother is only looking for a meal ticket. He's determined to stop the nuptials whatever it takes, but the shy wedding planner his mom hired is harder to intimidate than he expected. When Cora Preston worked up the nerve to leave her abusive ex and move with her young son to Gracely, it was a huge step. Accepting the position as wedding planner at brand-new Mile High Weddings took even more courage. 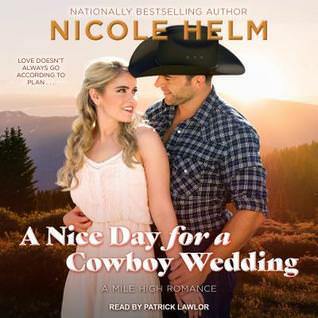 But Cora's biggest challenge is turning out to be the bride's handsome-and stubborn-oldest son, Shane, and the way the strong-willed cowboy makes her feel. Can the heat crackling between them warm two hearts suspicious of love? Thank goodness there was no over the top drama. Hmmmm.... I'd rather have a duke than a cowboy! ;-P haha! Omg hear me out...COWBOY DUKE! I love the fact that they actually talked through their problems! This sounds like a nice read. Good to know there is no unnecessary drama, though I imagine it would be hard for a shy person to be a wedding planner, even more of a challenge planning the wedding for the mother of the guy you like! Yay for adulting and cowboys! You had me at cowboy and wedding lol. Glad you enjoyed this one. I just finished a Christmas romance but yes, the drama was a little bit silly.